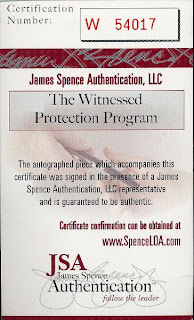 Signature Arts, Inc.: James Spence Authentication: Authenticating Memorabilia or Pushing An Agenda? JSA Fails Pieces They Already Certified As Authentic! 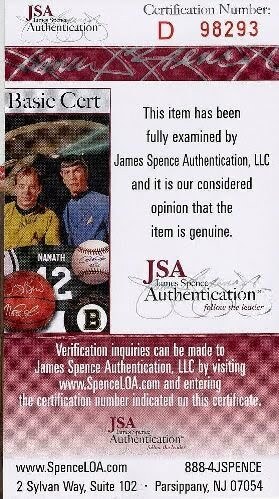 James Spence Authentication: Authenticating Memorabilia or Pushing An Agenda? JSA Fails Pieces They Already Certified As Authentic! 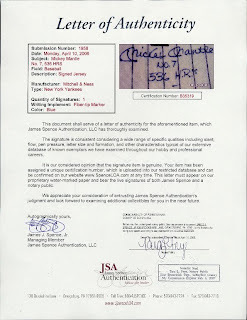 We have heard people in the autograph and memorabilia collecting community say that James Spence Authentication (JSA) will fail anything that has previously been certified by any other forensic examiner. We decided to put this assertion to the test, with an unusual twist. We had several pieces certified by JSA. 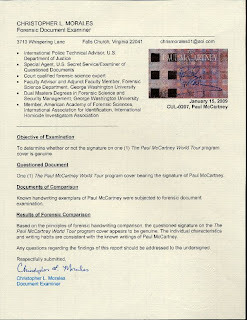 We then had them certified by Christopher L. Morales, Forensic Document Examiner (Chris Morales). What would JSA do with the pieces that already had JSA certifications after they also had certifications from Chris Morales? Would JSA really fail pieces it had already certified? Look at the results and you can decide for yourself what a JSA examination really amounts to. 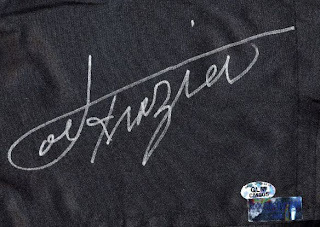 The first item is a pair of boxing trunks signed by Joe Frazier (detail below). The piece comes with a JSA sticker affixed to it, W54017. 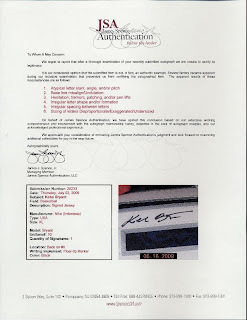 It states that Joe Frazier signed the piece in front of a JSA staff member. 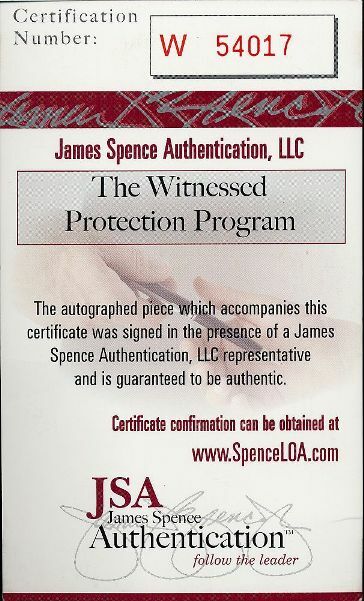 It is part of their "Witnessed Protection Program," the highest guarantee JSA can give (below is the certification). We showed the same piece to JSA again after it had been certified by Chris Morales. 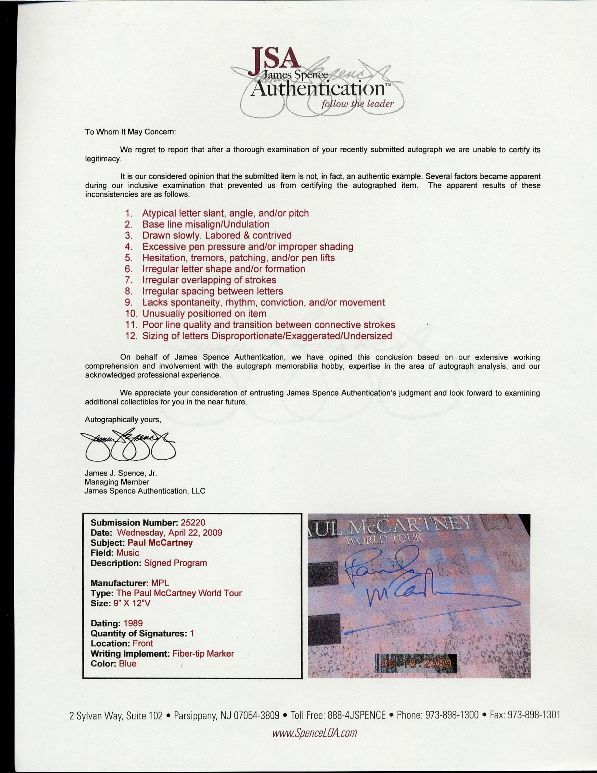 The only difference is now it has a hologram and certificate from Chris Morales (see below). As seen, it is the same pair of boxing trunks. 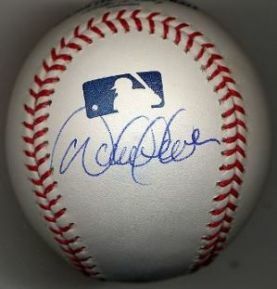 It has the same signature. What did JSA do with the piece? That's right, they failed it. JSA gave eight reasons to explain the flaws in the JSA "Witnessed Protection Program" piece of memorabilia. Apparently, the mere presence of Chris Morales' certification has caused the JSA "Witnessed Protection Program" to grow atypical letter slant, angle and/or pitch. Did this problem occur when the JSA staff member witnessed the piece or afterwards? Not only did JSA fail the piece, but Larry Studebaker, James Spence's main authenticator, laughed out loud and said the piece was "f-ing horrible." Really? A piece from JSA's "Witnessed Protection Program"? 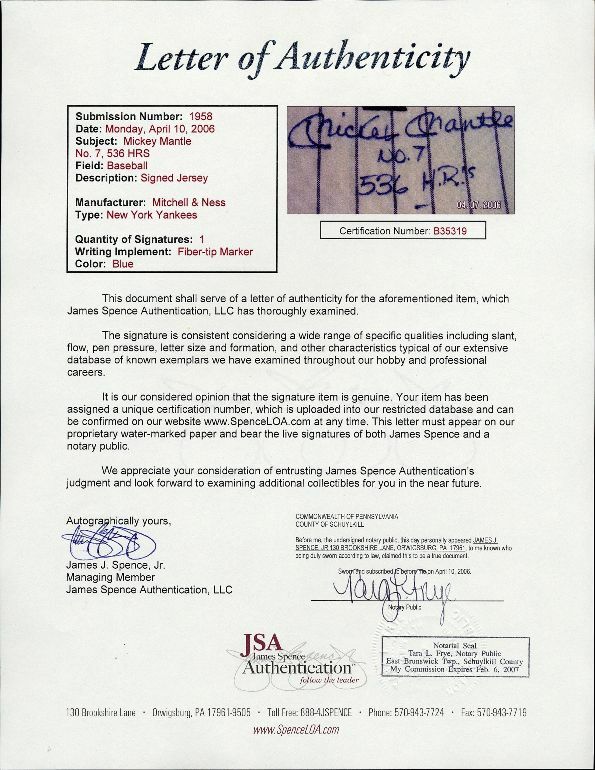 According to Larry Studebaker, James Spence himself personally checks all of the items before he issued a JSA certificate. James Spence did not overrule Larry Studebaker. According to JSA, their previously witnessed piece is now a forgery. 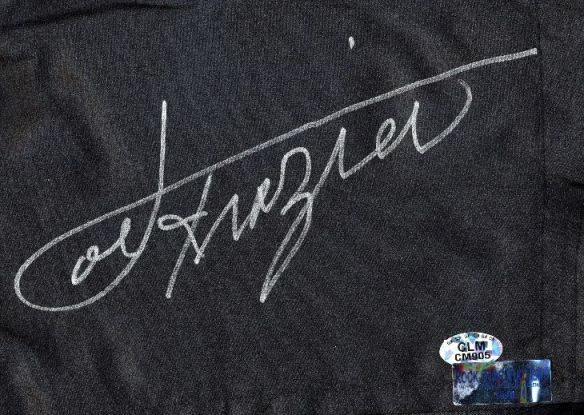 Did the irregular letter shape and/or formation occur when Joe Frazier signed the piece in front of the JSA staff member? Did it occur after JSA put its identifying sticker on the boxing trunks? Did it occur after Chris Morales certified it? Just what does the "guaranteed to be authentic" on the original JSA certificate mean if JSA fails its own witnessed piece? How could this happen? Would it happen again? 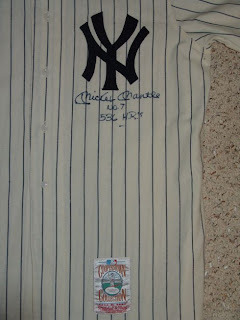 The next piece is a Mickey Mantle jersey (below). Accompanied by a full JSA Letter of Authentication, it has JSA sticker number B35319. Same test. Would we get the same results? Would JSA fail an item JSA had previously passed if Chris Morales passed it? 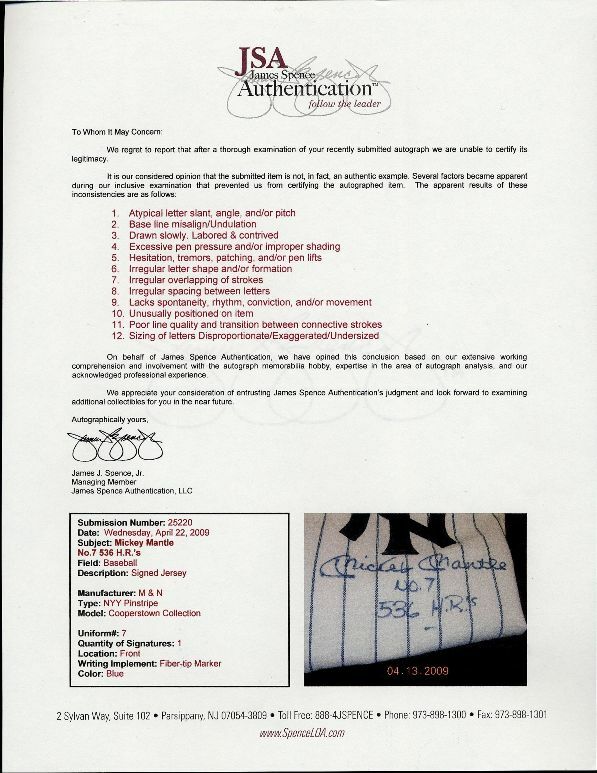 This time, JSA found twelve reasons to fail the Mickey Mantle baseball jersey that had already been certified by JSA. 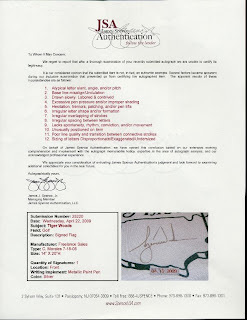 Apparently, now the signature suffered from such problems as "Drawn slowly, Labored & contrived," "Hesitation, tremors, patching, and/or pen lifts" and "Unusually positioned on item." 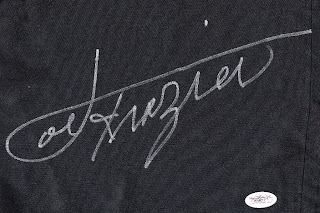 When did these problems, and the other problems, creep into the signature? Before or after JSA issued its first certificate? After Chris Morales certified it? How did that change the signature? 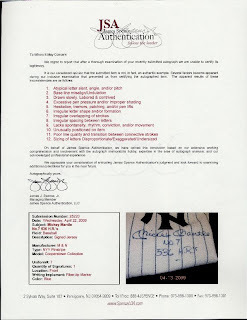 It certainly seems that JSA was examining Chris Morales' certificate more than the Mickey Mantle jersey the second time JSA looked at the same piece JSA had already certified as genuine. How is that a legitimate business act? 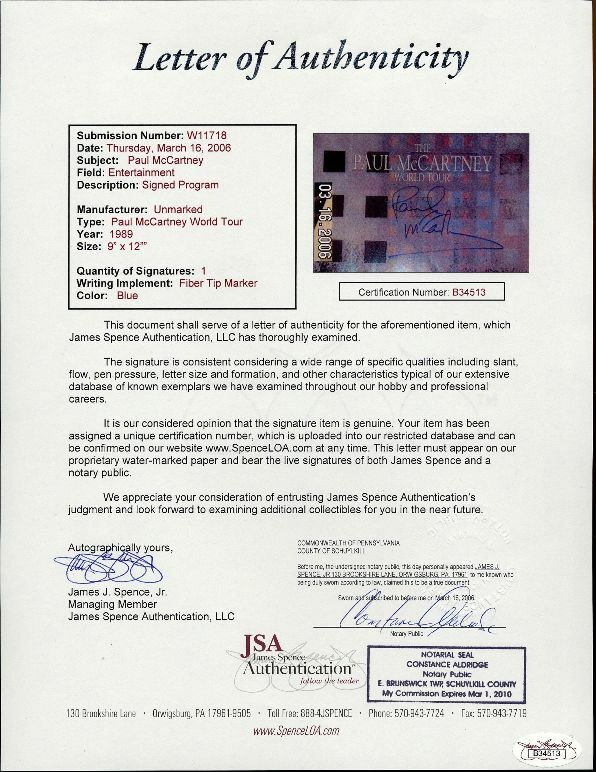 Shouldn't JSA actually be judging the signature instead of any other certificates? Is this fair to their customers? 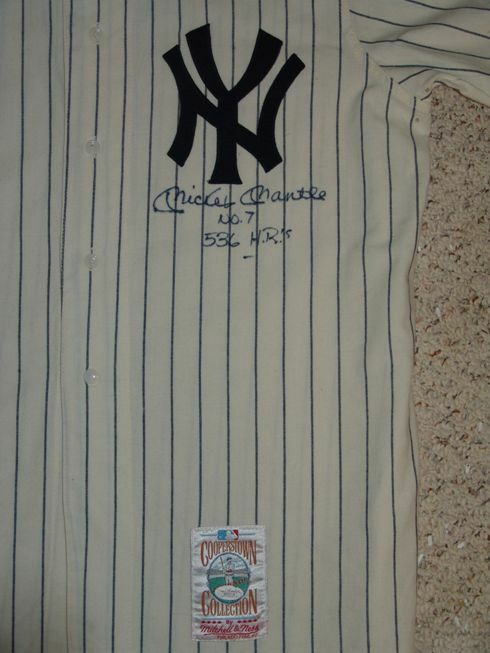 Apparently, now that Chris Morales had certified the jersey, Larry Studebaker feels the signature "isn't even close." Once again, when James Spence personally checked the item before he issued a certificate, he did not overrule Larry Studebaker. According to JSA, their previously certified piece is now a forgery. Surely, JSA would not do it again, right? Surely JSA would base its reports on the merits of the memorabilia. The next piece is a Paul McCartney World Tour booklet. 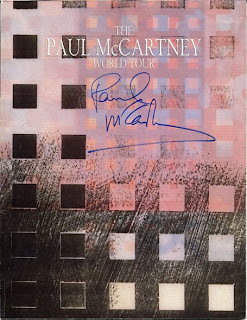 Signed boldly by McCartney on the cover, it is accompanied by the full JSA Letter of Authentication, and has JSA sticker number B34513. Once again, Chris Morales examined it, concurred with the initial JSA findings, and issued a certificate of authenticity. Would that solitary piece of paper be enough to make sure JSA would no longer have faith in the piece, even though nothing has been done to the signature? The answer again, is yes. Apparently, failing items certified by Chris Morales is more important than the validity of memorabilia, even if the same piece has previously been certified by JSA. This time, there were twelve problems with the piece. Apparently, at some time between the first JSA certificate and Chris Morales' certificate, the booklet developed, among other things, "Irregular letter slant, angle and/or pitch," "Excessive pen pressure and/or improper shading," "Sizing of letters Disproportionate/Exaggerated/Undersized," and "Irregular letter shape and/or formation". 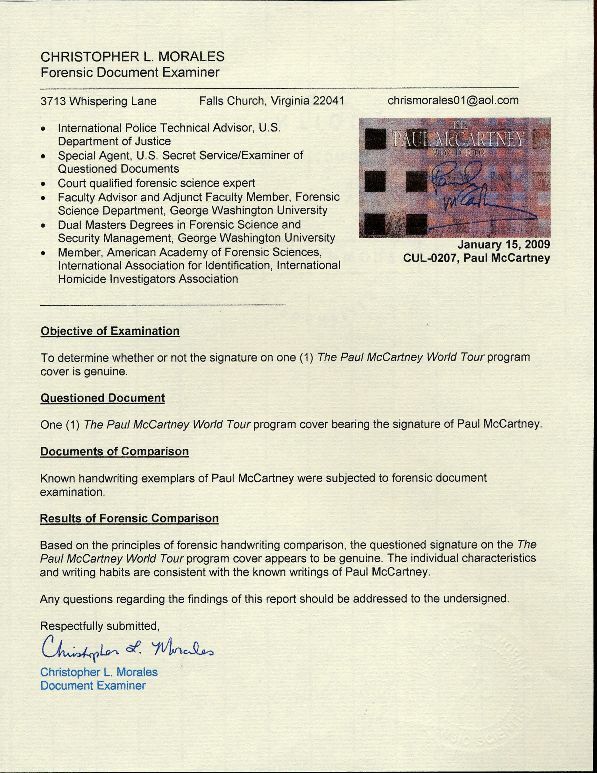 According to the JSA examiner, he had personally obtained several signatures of Paul McCartney, and the signature on the booklet was "nothing like Paul McCartney's signature. Chris Morales will pass anything." Didn't the twelve issues that JSA observed after Chris Morales certified the booklet bother JSA when it originally certified the piece as genuine? Once again, when James Spence personally checked the item before he issued a certificate, he stated that their previously certified piece is now a forgery. 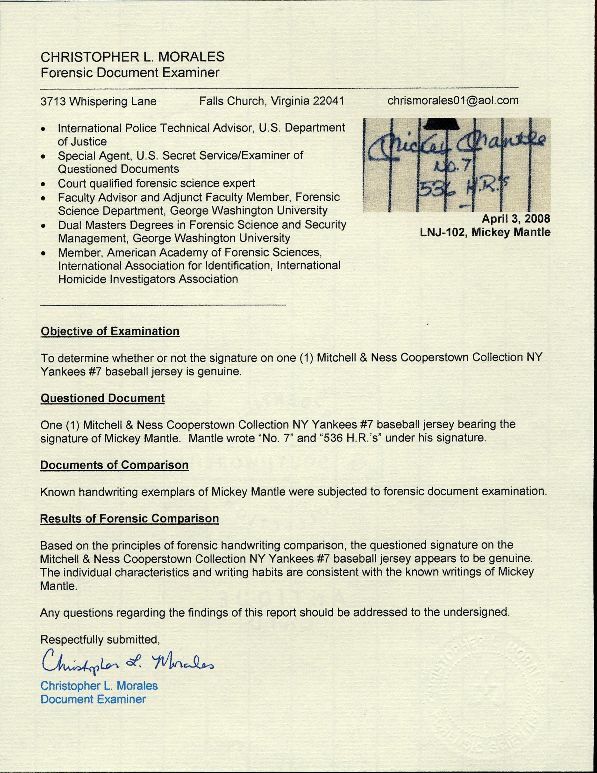 In JSA's original certificate reported that the signature on the booklet was consistent with JSA's "extensive database of known exemplars." Ironically, the JSA certificate passing the very item before Chris Morales certified it stated "The signature is consistent considering a wide range of specific qualities, including slant, flow, pen pressure, letter size and formation, and other characteristics typical of our extensive database of known exemplars we have examined throughout our hobby and professional careers". Four of the very reasons JSA used to praise the booklet when JSA originally passed it became reasons 1, 4, 6 and 12 when Chris Morales' certificate seems to have caused JSA to fail the same piece. Apparently, the problem is not limited to JSA's "Witnessed Protection Program" and their full letters of authenticity, but their "Basic Cert" authentications, as well. According to the JSA website, the only difference between the full certificate and the Basic Cert is the price. "Popular among dealers and collectors alike, the Basic Cert employs the same valued authentication process to verify lesser valued autographed items. Included with the Basic Cert program is a 3" x 5" James Spence Authentication registration card printed with a unique certification number corresponding to the alpha-numeric tamper evident label. 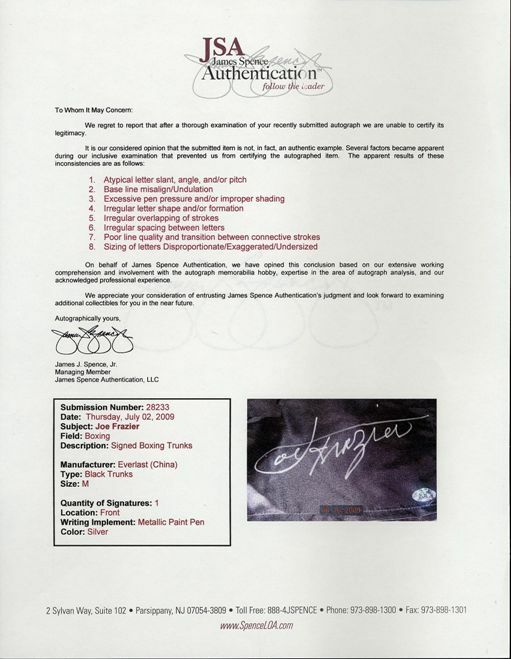 Of course, similar to the Premium Letter of Authenticity each certification number is uploaded into our exclusive database for 24-hour customer verification access. All Basic Cert cards are fully transferable without resubmission." Unfortunately, if Chris Morales sees the piece, the "fully transferable" concept goes right out the window. It certainly seems that JSA is likely to fail any piece that is attached to Chris Morales' certificate. The same seemed to be true of witnessed pieces. Chris Morales certified this Upper Deck certified, witnessed piece. 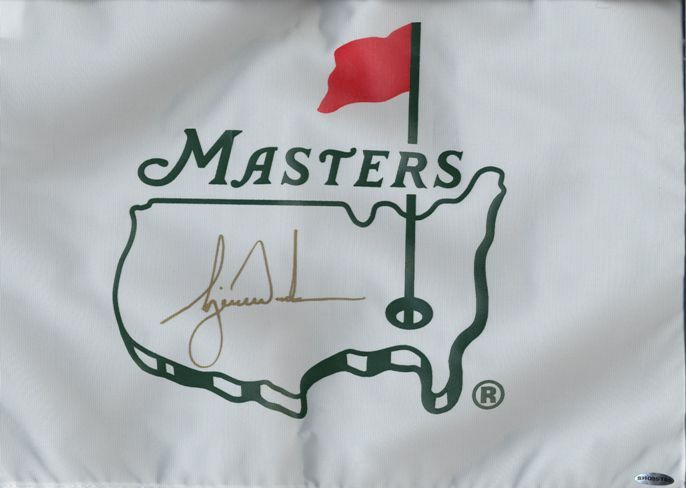 Tiger Woods signed the piece in front of Upper Deck's certified witness program. 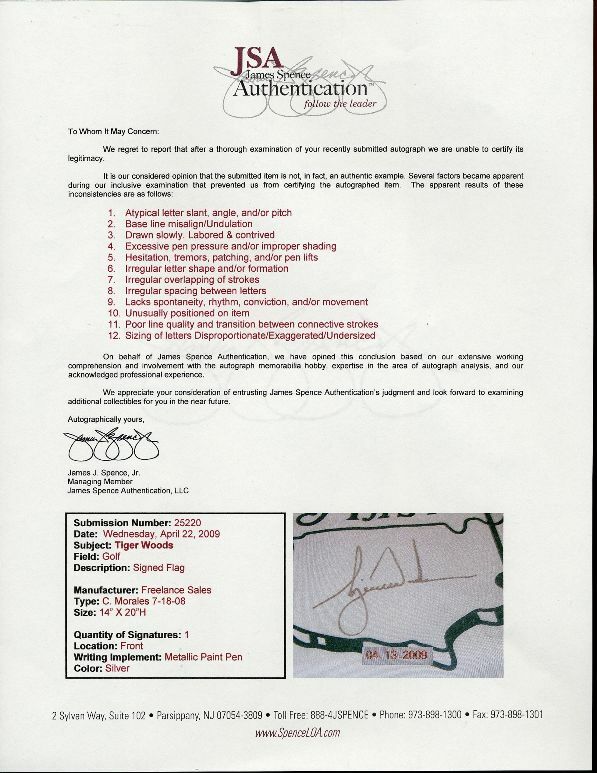 Unfortunately, if JSA gets the chance to turn down the Chris Morales certified piece, which is a clean, textbook example of Tiger Woods' signature, JSA makes the most of the opportunity. JSA even went so far as to list "C. Morales 7-18-08" as the type in the descriptor box. JSA listed twelve reasons for failing the Upper Deck witnessed piece. 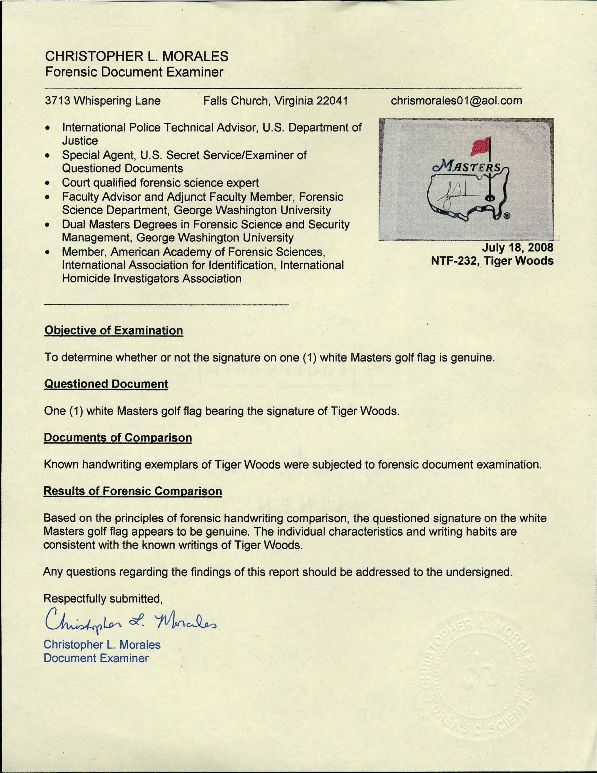 In fact, when the piece was examined, the JSA representative picked up Chris Morales' certificate and stated "it's amazing what this guy gets away with." Even worse, on JSA's own website, it lists "Valued auction houses and dealers employing our services include"…you guessed it: Upper Deck. 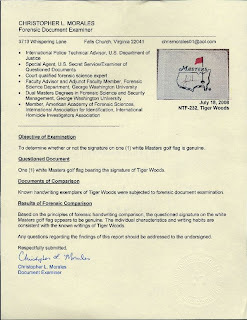 JSA failed his own client's piece when it showed up with a Chris Morales certificate. JSA proved consistent with another Upper Deck witnessed pieces. JSA's client's witnessed pieces. Chris Morales certified the piece (below). 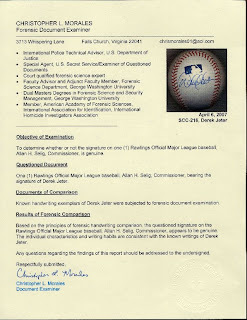 Despite Upper Deck's guaranteed "5-step patented hologram process," a Chris Morales certificate seems to doom practically anything JSA sees. 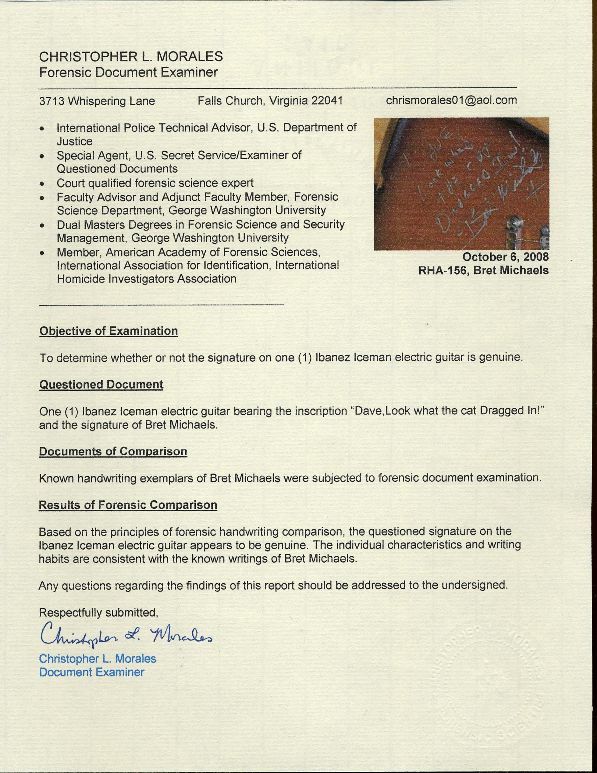 Other witnessed pieces did not fare any better, like the below Bret Michaels signed guitar. Chris Morales certified the piece as authentic. One of our associates made an appointment with JSA in a hotel conference room after one of their trade shows. There were several clients there, all getting individualized attention from JSA. 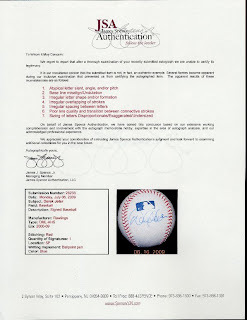 An individual who Larry Studebaker told our associate was a "regular client" also had a Bret Michaels signed piece. Studebaker told our associate he was not comfortable with the guitar. Larry Studebaker pointed out that the "regular client's" piece looked "completely different" than our associate's, so obviously his was a forgery and the regular client had a genuine piece, which JSA certified as genuine. 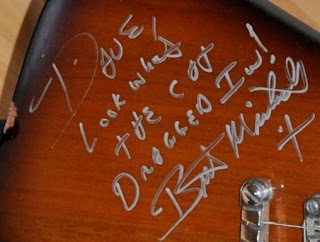 We know Bret Michaels of the group Poison signed and personalized our associate's guitar. You can even see the inscription in the photo. 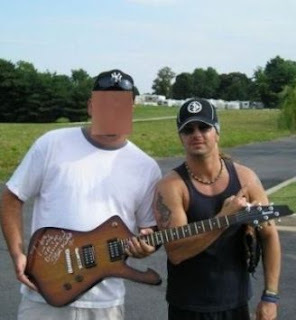 If the "regular client" had a piece that looked completely different from our associate's, and we have pictures of Bret Michaels signing and posing with ours, shouldn't the piece that looks completely different from the guitar be the one JSA failed? Apparently, JSA did not think so. 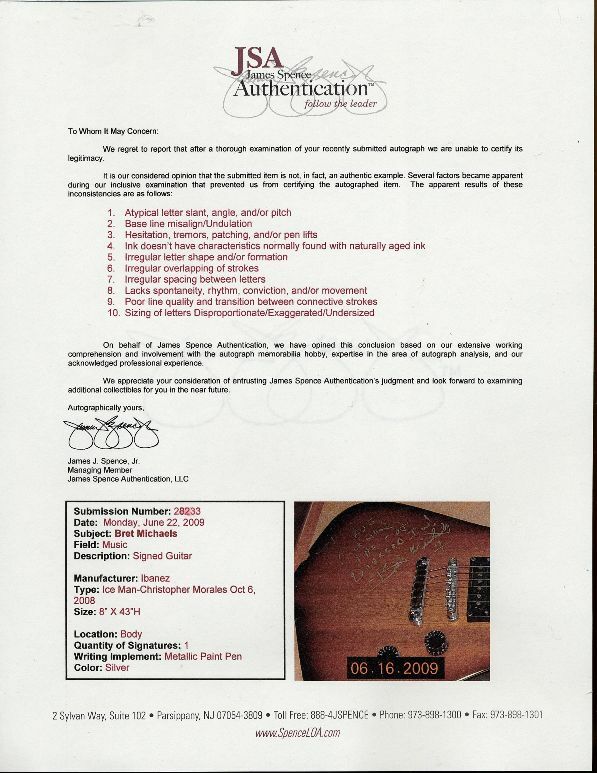 As a matter of fact, when you look at the following JSA report, in the descriptive box, JSA even referred to Chris Morales’ report in the text describing the type of guitar. 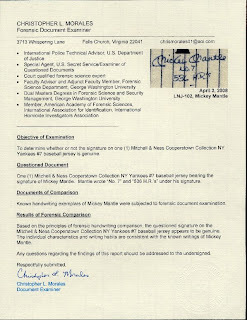 What was JSA examining, the signature or Chris Morales’ certificate? Incidentally, JSA also criticized, among the other issues, the fact that the “Ink doesn’t have characteristics normally found with naturally aged ink”. This is quite a perplexing criticism, when one considers the fact that Bret Michaels is still alive and, theoretically, could have signed the guitar the very day that JSA looked at it. How is ink currently on the market used by living people – possibly really recently - supposed to age? Interestingly enough, our associate witnessed some disturbing behavior during his visit with JSA. Another of the "regular" clients came with a stack of 40-50 photos. Larry Studebaker had the photos in a pile on his table. They were upside down. The photo side with the signature was on the bottom. While Larry Studebaker chatted with the regular client, he placed a JSA on the back of each photo - without even turning them over - and passed them on to his associate to process. He did not even look at any of the photos, but they were all certified by JSA. Apparently, being a "regular customer" of JSA has its perks. One afternoon, James Spence had the opportunity to show whether or not his practices detailed throughout the story above were an anomaly or standard JSA operating procedures. 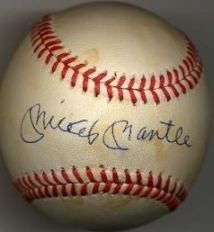 James Spence sat down with a collector and briefly looked through a collection of baseballs. 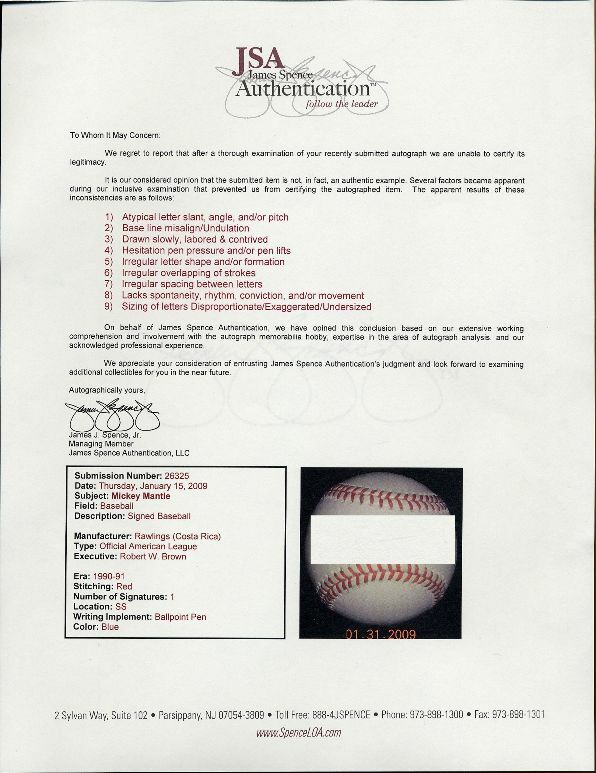 Prior to his examination, he was informed that all of the baseballs had been certified by Chris Morales. You guess right. Everything failed. 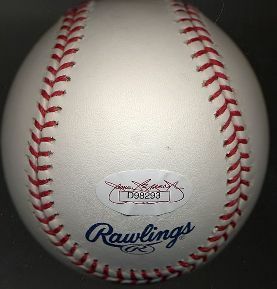 One of the three photos below is of JSA certified baseball B91695. One of the baseballs below is of JSA certified baseball B81823. 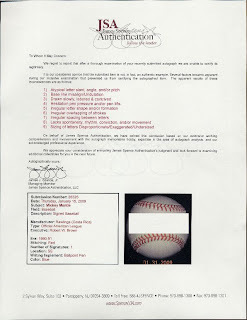 The other baseball was one of the baseballs that James Spence said was a forgery, after he had been informed that Chris Morales had certified it. They are in no particular order. We defy you to figure out which one is the "forged" baseball. 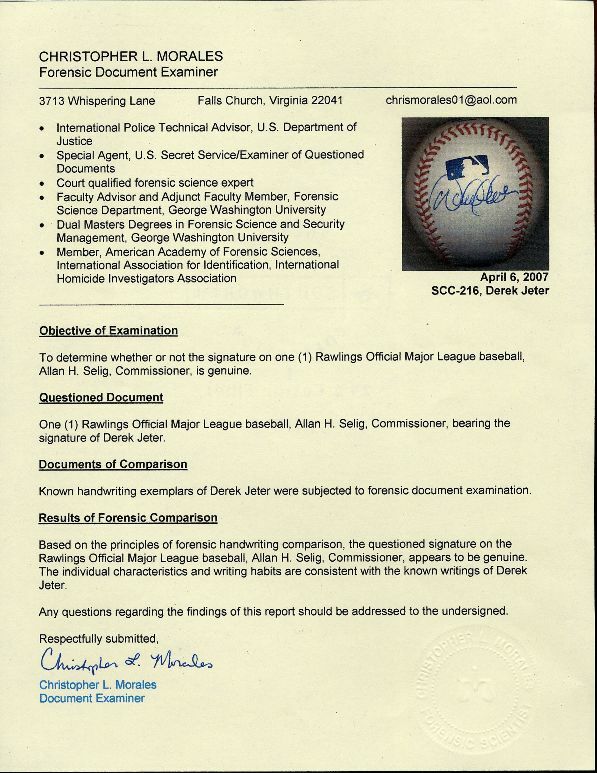 To make this more like a pop quiz, we have removed the photo of the "forged" baseball from JSA's report. Can you tell which one is the failed ball? Can anyone justify that one of these was written by anyone other than the signer of the other two? 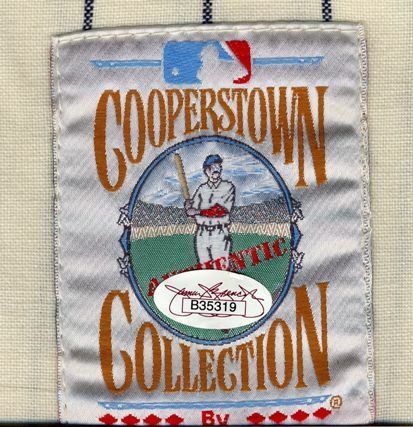 James Spence told the collector that everything he had were "fakes and frauds." He further told him that he should get his money back ASAP. At the very least, the preceding test cases question the company's ability to carry out the service of authentication. In each of the above test cases it was found JSA failed the same pieces that they had already certified as authentic. 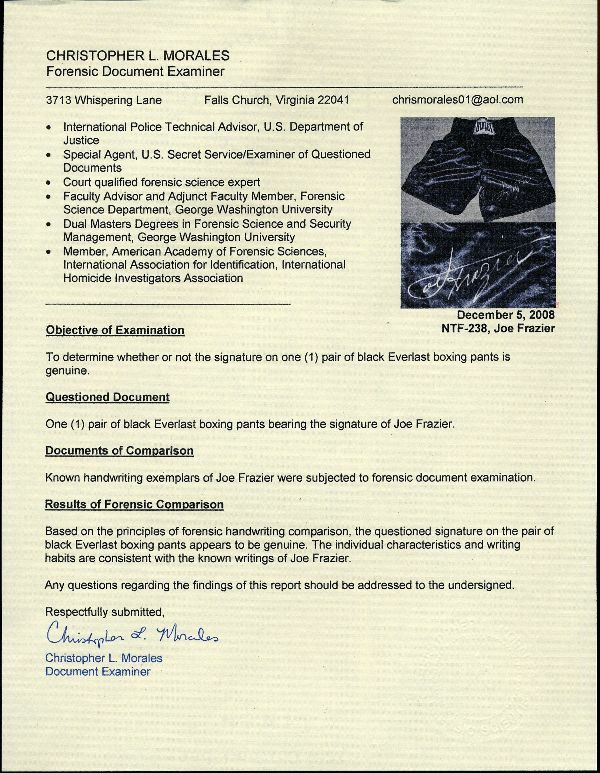 It certainly lends credence to the assertion the company will fail anything that has previously been certified by any other forensic examiner. This includes a piece, the Joe Frazier trunks, that was signed in front of them. What then is a JSA certification worth if their own authentication standards are disingenuous, capricious, and arbitrary? 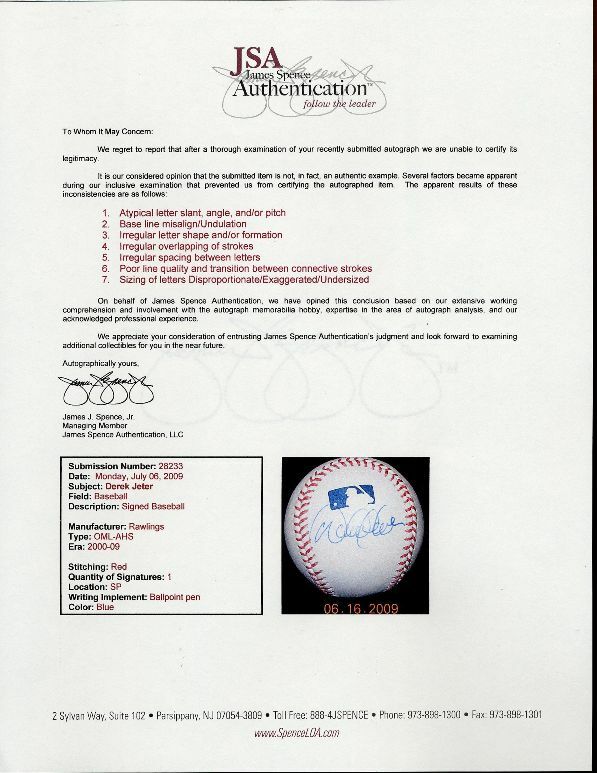 Considering the work that James Spence and his staffers do, and their apparent combined bias and indifference to the genuineness of the memorabilia they are charging customers to examine, there is a problem with "fakes and frauds." If James Spence and his staffers want to determine where the source of such "fakes and frauds" are, they might want to start by looking in a mirror. In closing I am not a real big Chris Morales fan but the customer has the right to have the signature examined. 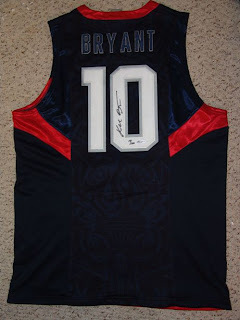 When JSA tells a customer or client that an autograph is not authentic, they trust that it has been examined. As you can see that's not the case, in fact it's just plain dishonest. Great blog. I have had nothing but problems with Spence. 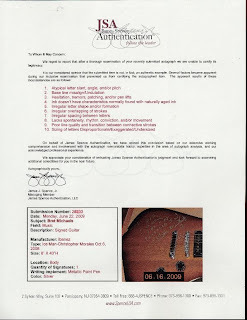 I have a signed Aerosmith guitar that was signed at a radio station. I actually have pics of them signing it in 1990. I won it in a charity event done by the station. I sent it to Spence and they said it was not authentic. It had 8 characteristics that they did not like. I'm so pissed!! The problem is that people won't buy non certified autographs even when we know they were signed in person. So we rely on these authenticators to give us certification so potential buyers trust the item. 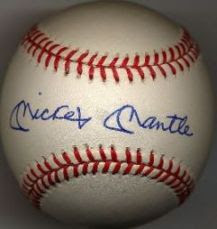 In in my way to spence now to get a Seaver autograph certified. He signed the bat in front of me but people won't consider buying it from me without it having been authenticated. So I'm taking a chance. 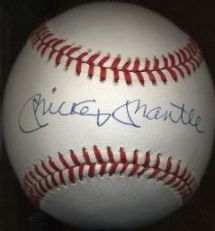 Ive been in the collectibles market for many years.in my opinion,if anyone shows a signed anything to a "certifier" and they dont pull out a refrence book with in person authentic signatures,the opinion from them is garbage.there is no way,anyone in the world,can remember every single stroke from every famous person without some type of refrence.so if they just look and say fake,their fake.even medical professionals have to refer to history.great proof of calling someone out.i enjoyed the write up a lot.i found this writeup,because i never heard of jsa,now i know why.the piece i was going to buy,looked nothing like all the other autos i have seen from the star i was going to buy,now ill likely pass on the jsa stuff.would be better buying blindly from some shmoe. This is why most reputable authenticators use databases with templates of the various signatures as a person's signature changes over time and depends on how fast they sign and the circumstances involved. You're right...but even then, they are only guessing, unless signed exactly the way their 'on file' signature appears, and they seriously take the time to properly identify permanent characteristics of that signature. I have a friend who was in celebrity protection for years. He handled some of the biggest musicians and A-list Celebrities. well, he had the members of Van Halen sign a vinyl cover for me. I submitted it to PSA/DNA as a step to authenticate and then have another party appraise it, enabling me to properly schedule the piece for my household insurance. well...they failed it. I've paid good money to adventure to shows, for the experience and to add to my personal collection, paying money for an athlete to sign something I brought., meeting the person in the process and watching them sign my item. Subit after the fact...failed. Amazing. 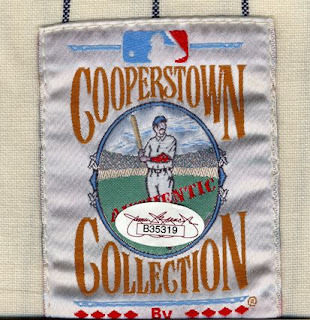 I've even taken sports cards....submitted to one company, thought the grading was low...after much effort removed the card from the case, submitted to another 'reputable' company and gotten a higher grade. It's ridiculous. These services are almost as bad as the crooks who forge stuff in their basements. Unfortunately the companies such as JSA, PSADNA and the like are factories that take volumes of memorabilia. it's a 50/50 that the signature will pass, that the grade will be accurate. For signatures, as you said...so many factors are involved for any specific signing...that unless they really get in their for their comparisons, the collector is the one who loses. Almost everyone is shady at best. 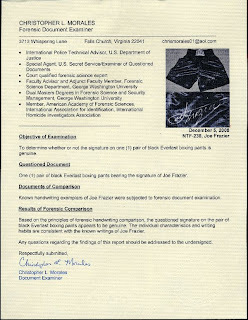 The only way to have a guarantee is to go to a Board Certified and Court approved forensic hand writing examiner. They are trained in the art of identifying forgeries. The PSA's and Spences of the world are self trained and normally sports dealers that could not make go of it. They do not do legal or court work and can't. They are not qualified. 90% of their authentications are guesses from untrained self proclaimed experts. Only use Forensic examiners. I dont disagree with you about James Spence,one reason he is no longer with PAS/DNA. He has done this a lot on any item authenticated by another third party. 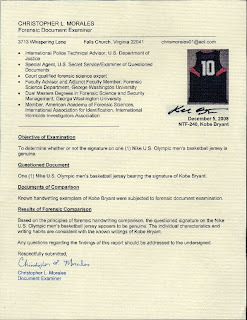 However I would not use Chris Morales as an example, he has been under investigation by the FBI for fraud himself. See Google..
James Spence sounds like a twerp. Probably got jammed in a locker too many times by jocks in high school and now he's taking it out in the real world. Granted, Morales was probably the class weasel feeding misinformation to the jocks the whole time in an attempt to ensure that Spence missed the daily after-school Dungeons and Dragons game. Freakin nerds! They'll be fighting each other with plastic spoons and headgear everyday for the rest of their lives...up until the street lights come on to indicate their curfew for the evening. So is PSA?DNA the best of the bunch?